This rattan conversation set is ideal for lounging around with friends and family. 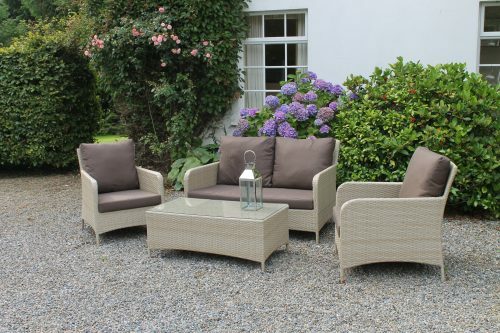 The flat rattan weave is in a neutral tone and is set off with beautiful plush brown cushions. Long evenings can be spent on this in the great outdoors. The rattan material is ideal for outdoor garden furniture as it is virtually maintenance free. The set comprises of a two seater couch, two armchairs and a coffee table.